You've probably read this elsewhere, since tv news types and bloggers love to do this story, but Dahmer's boyhood home in Ohio, the setting for a good deal of My Friend Dahmer, is for sale. The owner is a pal of mine, and hopes the press devoted to my book will help him sell the house. 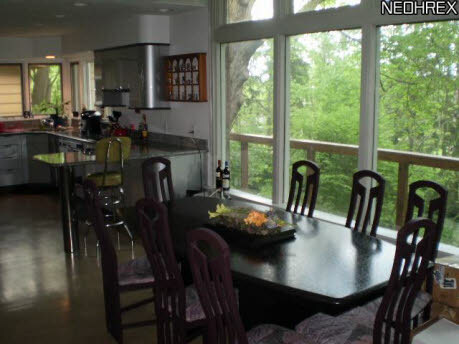 Obviously, it's a tough sale, but it's a beautiful home on a gorgeous wooded, hillside lot. I grew up in a very similar home, kind of a Fab Fifties, Frank Lloyd Wright knockoff, and would jump at a chance to own a similar home again. 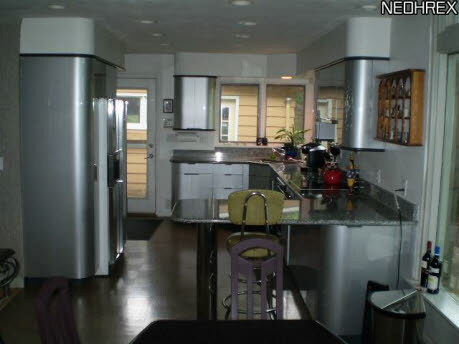 Dahmer's dad sold the house in the early 80s. 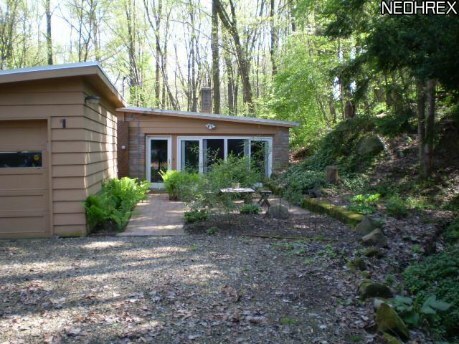 Lionel Dahmer was not particularly handy or interested in home maintenance and the house was fairly worn 15 or so years after the Dahmers purchased it in 1970. They were not the original owners. The house was built in the early Fifties and changed hands several times. The Dahmers were renting a place in nearby Barberton, a grimy rustbelt town that abuts Akron, and was known for, of all things, its match factories. But with two young children, Lionel and Joyce Dahmer were looking for the classic Nuclear Family Dream: a nice house in the burbs where their sons could romp in the woods. Lionel says he and Joyce were out driving in the country one weekend when they passed this house. Joyce excitedly demanded that Lionel pull in the driveway and, for her, it was love at first sight. This was her home. It was perfect. She couldn't be talked out of it, so Lionel, in an effort to please his wife and keep the peace in an ever more contentious marriage, scraped together the funds to buy it. Jeff was starting the 3rd grade when they moved in. It was another classic example of Joyce's self-destructive irrationality. She was struggling with depression, and felt like an isolated and useless housewife while her husband enjoyed an exciting and fulfilling career as a chemist. It was a disparity that filled her with frustration and a growing resentment. But she didn't drive! So she inexplicably insisted on moving out of their Barberton neighborhood, with tightly packed houses and sidewalks and public transportation, for a house in the country where she knew no one and was totally cut off from everything! Without wheels, Joyce was trapped in her dream house. Even the grocery store, the stereotype refuge of bored housewives, was miles away. 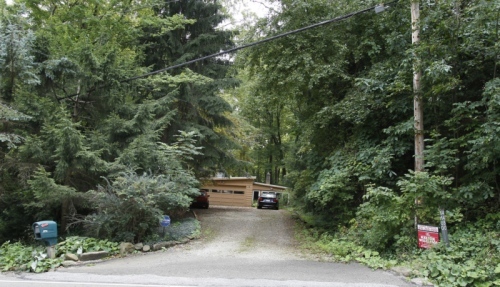 The Dahmer House is on a steep hill, one with no sidewalks or even a berm, just a massive 4-foot-deep country ditch on either side. Cars come flying over the crest of the hill. You take your life into your hands walking on that road. Not there was any place for her to walk. Bath has no town center. The nearest shopping district is a good five miles away, on the burby outskirts of the Rubber City. It's a small town, but has little of the characteristic, close-knit atmosphere of my hometown, neighboring Richfield (the two communities shared a school district). Richfield was Mayberry, with a corner drugstore and a soda fountain, and was a town where everyone knew your name. Bath, with twice the population, was a bedroom community for Akron white-collar professionals. If you lived in Richfield, you were from Richfield. If you lived in Bath, you were from someplace else. Joyce had locked herself into a suburban prison cell. There is a nearby neighborhood of 100 homes, but the Dahmer house, with its steep, rocky terrain is completely separated from it. Joyce, emotionally fragile and erratic, didn't make a particularly good impression on the neighbor housewives either. By insisting on buying this house, Joyce, already chaffing with her feelings of isolation, only increased that isolation a hundred fold! As a result she plunged into deep depression shortly after the family moved in. She spent most of the day in bed. Her stays in the mental ward followed. It's not unusual for the mentally ill to make poor decisions that make their situations worse. Lionel bought out Joyce's share in the house when the marriage finally crumbled in 1978. He lived there until 1983, with his second wife and the youngest Dahmer boy, who was in high school at the time. Jeff flamed out at college, then joined the army and was stationed in West Germany, so he didn't live here after high school. But, of course, Jeff killed and butchered his first victim in the house, a young hitchhiker he picked up near the local mall a few weeks after our high school graduation in June 1978, during the short period when he was alone in the house as his parent's divorce finalized. The body of Steven Hicks was hidden on the property until Lionel decided to sell in 1982 and Jeff, by then out of the army and living in MIlwaukee with his paternal grandmother, finally disposed of the skeletal remains when he was home for a visit. It's a grisly history, to be sure. The next buyer of the house knew nothing of all this, of course. He also fell in love with this unique house and its picturesque setting. He remodeled and renovated and made the worn and weathered hillside ranch a showpiece. And then came July 1991, Dahmer's arrest and the horrific finds in his Milwaukee apartment. Within hours the Bath house was a crime scene, ringed by police tape. Dozens of investigators combed the lot, sifting the dirt with screens as they searched for bone fragments. Imagine what a nightmare this must have been for the poor owner! With the snap of a finger, his beautiful home, into which he had sunk so much effort and money, was made virtually worthless, nothing more than an infamous ghost house where local teenagers pulled into the driveway to frighten their dates. He was also gay, and his home was the spawning ground of the most infamous killer of gay men in history. After the police cleared out and the headlines died down, the house went on the market. There it remained until my friend bought it in 2006. He's a rock star, as I've written before. Chris Butler is best known as the creative brain behind the Waitresses, one of the most successful bands of Akron's famous punk scene, which also produced Devo, Chrissie Hynde of the Pretenders, the Cramps and numerous other bands. Butler was looking to move back to Akron after many years in New York City, stumbled across this house, as Joyce had many years earlier, fell in love with it and bought it. He lived there for awhile, then, as these things happen, moved back to New York. He rents it out, but would like to sell. For what it's worth, Butler, in my opinion, drove out whatever bad karma lurked in the house. He filled the place with music, as he and his friends jammed for hours on weekends. What better "cure" is there? Besides, Jeff wasn't killed here, so those who think his ghost haunts the place, why would it? If anything, his specter roams the halls of the Wisconsin prison where he was killed. As for Steven Hicks, who was murdered here, reportedly right at the entrance to the kitchen, pictured above, he was a huge rock-n-roll fan. In fact, he was hitching his way home from a rock concert when Dahmer picked him up. As I've written before, if Hicks' spirit is lingering about, it's probably a pretty happy ghost after years of grooving to great tunes. The next owner of the house should definitely think about remodeling the house and fixing it up since it's been so long since someone has lived there and taken good care of the place. They should probably start looking for a high-quality insurance company too to protect their property. I bought my first house two years ago and found a great home insurance company serving Stoneham MA, which is where I currently live, and I am very happy with my decision. It's great to know that my home and valuable possessions will always be protected!